Demonstrate the energy efficiency of your window product. The EP3500 is specifically designed for large scale presentations or show room displays. The bright and bold LED displays ensure that your performance numbers can be seen from a long distance. The unit also comes with a power cord to ensure you can easily reach an outlet. By the UV Performance number, the words "Fading Protection" remind customers that your window will protect their valuable belongings from UV damage. By the SHCG number, the words "Heating & Cooling Costs" bring the discussion back to the almighty dollar reminding them that your window product will keep more dollars in their own pockets. Please note that the Window Energy Pro is capable of testing glass samples only. The opening is not large enough to fit around the sash of the window. For testing existing windows, see the Window Energy Profiler. The Solar Spectrum Meter Sales Kit The Solar Spectrum Meter Sales Kit features the SS2450 Solar Spectrum Meter making it the most accurate sales kit offered to date. The SS2450 is a professional tool that adds instant credibility to .. 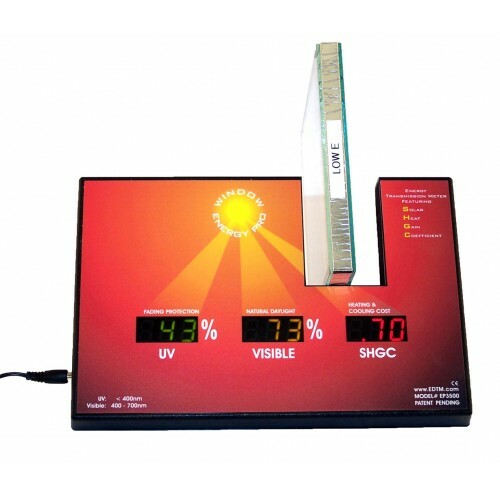 Solar Spectrum Meter Tell The Whole Story Of Your Glass, Window Or Film's Performance Other meters on the market today do not have the capability of measuring as much of the solar spectrum range as the SS2450 instrument. These other meters gi..
International Power Converter The PC1043 Power Converter is the perfect compliment to our HL1040 Infrared Heat Lamp & HL2040 Infrared Heat Lamp with Flip-Up Base that is rated for 110Vac. International customers can add this simple co.. Window Energy Profiler Tests Windows In-Frame Test the energy performance of installed windows. The WP4500 displays four real-time measurements of windows: the estimated SHGC value along with the UV, Visible Light, and Infrared Transmissi..